...because every tractor has a story. 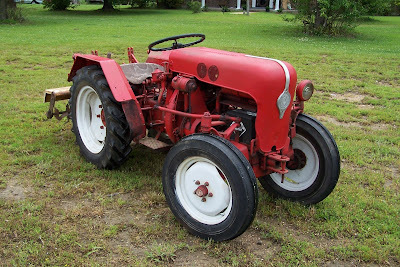 I grew up in Columbus, Mississippi with an A Farmall. I drove many miles in my mind sitting on the seat of that red tractor. It's my favorite tractor in the world. That tractor is also the first tractor my daddy, Gary Holtman, ever owned. It seemed to me that Daddy always enjoyed working on tractors more than anything, and in recent years he has been able to spend more time gathering up old tractors and fixing them up. Several of them are special because they once belonged to special people in Daddy's life. Every one of them has a story. I got Daddy to tell me the story of each one and have put down the words here. Recently I decided to record the stories of other people's tractors and share them. I let them just tell me what they know about the tractors, and sometimes there's another interesting story sprinkled in! In doing this, I hope to preserve these stories so everyone can enjoy them. Now my daddy's tractors and stories are being joined by other tractor folks! "A T5 Bumgartz 1-cylinder diesel air-cooled. *Mr. Charlie Arndt gave this to me a number of years ago. The front wheels will turn square to the right or to the left. You’ll see the geometry above the front tire. Real strange. I’ve had it a number of years. It’s a T5 1-cylinder diesel. That’s a wood seat on it. I keep meaning to put varnish on that seat. Just haven’t got around to it yet. He had bought a tiller for it and put it on the rear from Sears Roebuck. And he said it worked great. He hit a root and broke the chain. I’ve repaired the chain; just haven’t put the motor on it yet. It has a separate motor. It’s got 8-speed transmission." *This is a very small tractor. Daddy told me that it came from Germany where the farming spaces are small and that many plant nurseries in the US used them. 1939 F 14 Farmall "Grandpa's Tractor"